NOSE: Mostly mild, heavily roasted dark malt, but there’s a backdrop of “cola” and some nice floral hops. A little more complex than your standard brown ale. TASTE: Nice balance of sweet caramel and cola acidity. Some hop bitterness comes through in the middle but disappears well before the clean, smooth finish. MOUTHFEEL: Silky smooth and medium-bodied. DRINKABILITY: Very high. A true session brew with just enough complexity and character to make it memorable. 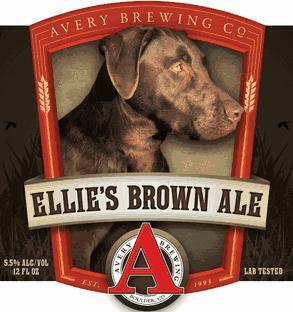 There are better Brown Ales out there, but I would have no hesitation ordering a few pints of Ellie’s. Plus, the bottled version has a dog on the label. I love dogs. Posted in Tasting Notes.Tagged Avery, Brown Ale, Ellie's, session beer.